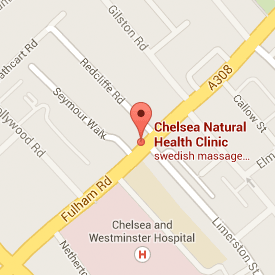 at Chelsea Natural Health Clinic, Fulham Rd, SW10 with Charles Powell. Kinesiology is a manual medicine that uses the body’s innate intelligence to help understand any chemical, nutritional, emotional or muscular imbalances in the body. It views the body from physical, emotional and chemical interactions that may be influencing the person’s state of health. Kinesiology is an all encompassing therapy that covers any condition or ailment. Here at Chelsea Natural Health we haveCharles Powell who practices Kinesiology and he can be contacted using the form above should you have any questions about kinesilogy and what it has to offer you..